Confidence can be fragile for many athletes. One bad hit, and boom, confidence is lost… I call this the hockey confidence roller coaster? Many players allow their confidence to be jolted by immediate results and circumstances. What do I mean by the hockey confidence roller coaster? I am talking about the athlete who loses confidence easily or has fragile confidence based on his immediate results. With each missed shot, poor shift or big hit, confidence goes up and down depending on one’s performance. But self-confidence that goes up and down daily IS NOT true confidence. True self-confidence is stable, long-term, and lasting even under adversity or poor results. Taking one bad hit should not allow your confidence to drop drastically in my opinion. Any hockey player can get an immediate boost of confidence from a good performance, but can you keep confidence even after a poor shift or taking a bad hit? I don’t want my students confidence to be determined my one hit, one shift, or even one game. The key is to keep your confidence even under adversity. How do you keep your confidence? First, you base confidence and years or months of practice and play, not the last game. How do you regain lost confidence in hockey? You start by asking a question: What makes me feel confident? You don’t want to focus on the bad stuff from the last game or even shift. You can always default to your base of confidence in hockey. 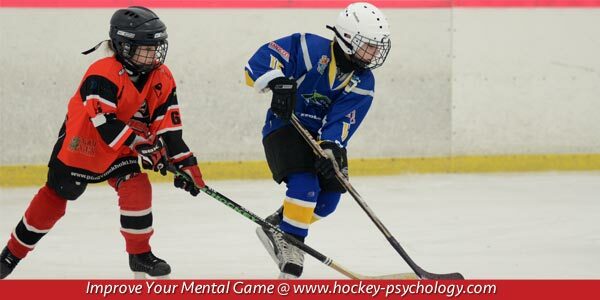 Your confidence base comes from your abilities, practice, hard work, good coaching, fitness, and a good mental game of hockey. Thus, to boost your confidence for hockey, you have to let go of mistakes and bad shifts and focus on what makes you a good hockey player. What you focus on, you receive! Thanks for the article. My son plays AA hockey and is a highly skilled player but does struggle with confidence when things go wrong. He tends to over analyze himself and beat himself up for mistakes. the hardest thing for him is to recover and play to his ability. My son has played 3 years of “AA” hockey. We recently moved to a new area and hockey program, and he was placed on the lowest team in the division. He has lost all confidence in his abilities. He is very coachable, and is a good goalie. He does very well at a school based hockey academy, but has been taking some verble abuse from other kids, about his placement this season. I have told him that it was all political, and because no one new him in this new town. It has come to the point where he is skipping hockey school. No good for a 13 year old. He has talent, and loves the game, but is slowly losing his motivation. Any suggestions that may comfort him until the next season. 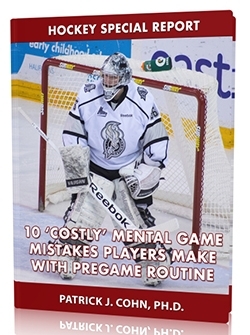 Use this as an opportunity to overcome a challenge in hockey. You want him to come out stronger as a player by not worrying about what others think or say and instead focusing on his game and goals. Our son last season was cut from Peewee A hockey, leaving him to play recreational league. This after playing his first season peewee on the A team. At first he was going to quit playing hockey altogether, after some encouragement i.e. use this year growth / learning year, so that next year you would be ready for Bantam tryouts…. the coaching on the recreational team, wasn’t good at all, suffice it to say, it was a miserable year, he didn’t allow himself to develop at all. Now that we have come across the ‘metal toughness’/ training aspect of sports, what can we do to have his mind over matter ready for tryouts? I had just finished having a bad game of midget BB, many of my friends were watching and now doubt me and my performance witch also makes me think twice of myself. What can I do. How do you know your friends are doubting you? Everyone has a bad game right? Don’t allow what you assume others think to affect your confidence.